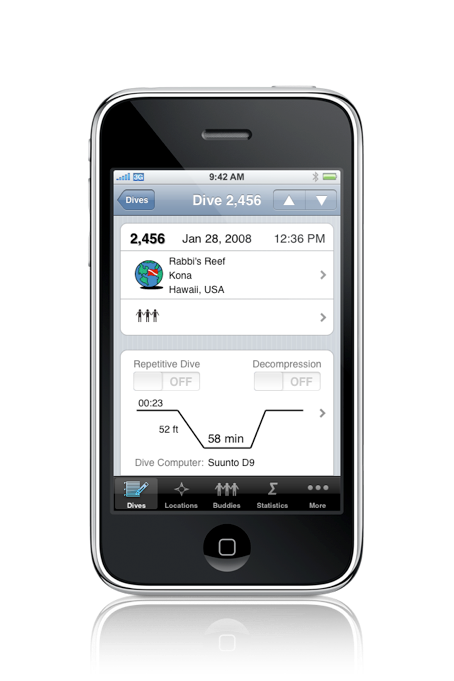 Dive Log is a native application that works with iPad, iPhone and iPod touch devices running iOS 4.3 or later. 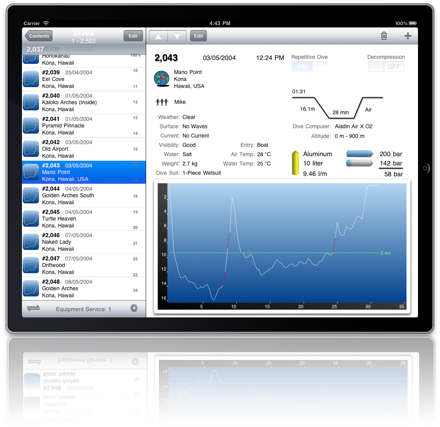 It provides full featured dive logging, display of logged information and statistics, integration with iPhone features and logbook exchange with your desktop computer. Use it at the dive site or on the dive boat to capture the information about the site while you still have access to it. Have an immediate answer the next time your dive guide asks how much weight you used on your last dive or have all the information you need about your dive history when you fill out that next dive waiver. Dive Log can exchange logbook information with your desktop or notebook computer running Windows XP, Vista and Windows 7 as well as Mac OS X. On Windows, support is fully integrated in Diving Log 5.0 and includes record level synchronization. On Mac OS X, support is integrated into MacDive and there is also a free conversion application available from More Mobile Software - Dive Log Manager, allows you to import complete logbooks or specific dives directly from Mac Dive Log 1.3.2 logbook files and from MacDive (versions 1.5.0 thru 1.5.3) as well as the new MacDive 2. You can also import dives from desktop logbook applications that support exporting data in Universal Dive Computer Format (UDCF). You can also backup and restore logbooks on Mac OS X with Dive Log Manager. We create applications for mobile phones and handhelds with a focus on iPhone™ and iPod® touch. Our goal is to provide high quality applications that enhance your ability to be productive or have fun when you are not within easy reach of your desk. Our first applications are designed with the SCUBA diver in mind making dive planning and gas blending calculations on the boat or at the fill station possible.